Chris Eubank Jr has responded to criticism from super-middleweight rival George Groves by labelling himself "the world's most dangerous gimmick". 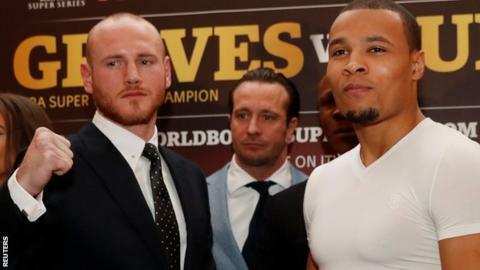 WBA world champion Groves, 29, has pointed to "gimmicks" in his rival's social media sparring videos in the build-up to their bout on 17 February. "I expect to be fully dominant and take him out between six and eight rounds," Eubank Jr, 28, told BBC Radio 5 live. "You'll see things he's said leading up to the fight are all a front." "On 17 February the world's most dangerous gimmick is coming for George Groves," Eubank told 5 live Breakfast. "I have trained for this fight my whole life. People have been asking how my camp has been going but I haven't had one. Instead, I have worked for this since I was 14 years old." Groves' world title will be on the line when the British fighters meet at Manchester Arena, as will a place in the World Boxing Super Series final, with the winner of the tournament collecting prize money and the inaugural Muhammad Ali Trophy. The bout will be the most high profile of Eubank Jr's 27-fight career, which so far contains just one loss - to WBO world middleweight champion Billy Joe Saunders. During the build-up Groves - who has lost three times in 30 bouts - has discussed Eubank Jr's relationship with his father, former two-weight world champion Chris Eubank. The Hammersmith fighter likened the pair to characters from BBC television show 'The Office' and speculated that they had a "really difficult relationship". "My ultimate goal is to create my own legacy and to stamp my own name into world boxing," added Eubank Jr.
"I believe I have made a great start. This is the type of fight where I can solidify my position in the sport of boxing. "This is my time now to become my own man, to step out of my father's shadow and prove to everyone I am the best fighter on the planet."